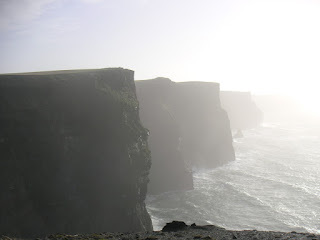 I decided I had to see the Cliffs of Moher - they'd been quite influential in my choice of where to go in Ireland so it'd be silly to come that far and not see them. The weather was a bit better on Thursday and the wind had died down a bit so I decided to try cycling up there again. I didn't get far - my legs felt lethargic and tired and my bum hurt (maybe time for a new saddle) Given that I had a long ride the next day I decided to take it easy, turned round and went back to take the bus instead. When I got on the bus I thought I'd better check that there was one coming back again. Apparently there wasn't. I started to get off the bus again but the driver talked me into going anyway. "What're you going to do otherwise - sit in your room and watch it rain?" he asked. Fair point. "It's only an hour's walk back". In this weather? He assured me that the weather was going to clear up again. There was an American couple on the bus, also staying in Doolin, who were going to walk back, and they invited me to walk with them. 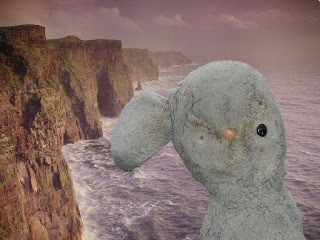 When we got to the cliffs we agreed to meet at five for the walk back, and went our separate ways for the afternoon. 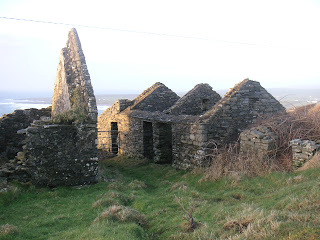 There appeared to be a lot of work going on at the cliffs in the name of sustainable tourism - increased visitor numbers over the years have accelerated the erosion of the cliffs, so there has been a need to keep things in check. There are some very new-looking paved walkways along the cliff edges and it looked like more were under construction. 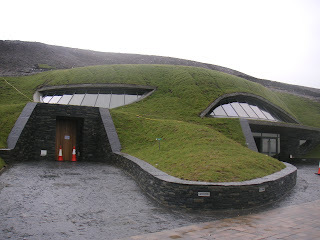 The visitor centre itself was built into the hillside, with a turf roof. Ever since Dgym and I got the natural building idea into our little heads, we've been wondering exactly how one mows a turf roof. Presumably that does become a problem after a while, and I just don't think a lawnmower would be very practical. We eventually came up with the idea of a keeping a roof goat. I thought about asking, but (a) they would have thought I was weird (b) it's such a new building they might not have encountered or considered this problem. Damn, now I wish I had asked. You can't walk that far along the cliffs on the new walkways, there was a muddy footpath going a lot further in one direction but it was blocked off and looked a bit dangerous anyway. The other direction led up to O'Brien's tower, which was quite high up and extremely windy. 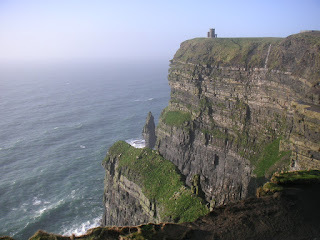 As for the cliffs themselves, they are big and rocky and everything that cliffs should be. Having walked every path I could and still with a couple of hours to spare before we were due to walk back, I came back to the visitor centre and browsed tacky souvenirs for a bit before caving in and buying a ticket to the Atlantic Edge exhibition, which turned out to be quite interesting and I suppose worth the 4 euros. Lots of interesting exhibits about the different layers that make up the cliffs, what Ireland looked like squillions of years ago. (not very much like Ireland) and the network of rivers that run beneath the Burren. By the time I got out, it was nearly time to go back but the sun had come out and there was just enough time to go back up and get a better look at the cliffs. As it turns out, I didn't even need to go outside at all. As I walked throught the visitor centre, I suddenly became aware of a cross-looking lady with a camera on my right, and a lightbox image of the cliffs on my left - I had inadvertently walked into her oh-so-authentic photograph. Oops! The walk back was lovely - the skies had cleared and the sun was starting to set. It's always interesting to talk to fellow travellers - this American couple were on their spring break and had been to London and Scotland first before coming to Ireland, where they were on their first day, and after Ireland they were heading to the south of Italy, where I am sure they will encounter much nicer weather than they've seen so far. They seemed to be really impressed with everything they'd seen so far, although apparently it rained a lot in London (hmm, I am sure I've heard that before) It was nice to have some company anyway, and talk about our respective travels, both past and future. If you do not wish to participate in this contest, please let me know by a mail to rooman@roomsnet.com. We will remove your entry with immediate effect..
We hope you and your friends/readers enjoy this contest.